We started out super gung-ho. “Let’s do bi-weekly blog posts! One every two weeks will be so easy.” And to be honest, it kind of feels like we’ve posted some recently. But apparently, time flies in the first year of business because we’ve been dormant since September. Over the past few months, we’ve been staying busy with projects, and we’ve teamed up with a few other new businesses and new events, to help them with their branding. Not only do we love branding projects, but it’s so much fun to talk to new businesses about their ideas and dreams. And we’ve only been in business for a year so we can definitely relate to the excitement, emotions and struggles of taking the leap. Check out some of the logos we’ve been working on, from juice bars in Pensacola, Florida to beer bars in Bolton Landing, New York. 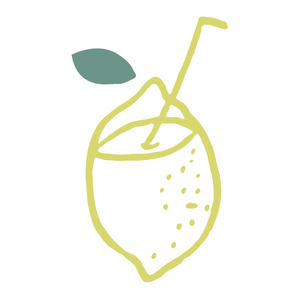 We are going to have to figure out a way to get down to Pensacola, Florida once this juice bar opens this summer. This juicy project had us working with funky colors, playful designs and hand-drawn illustrations. Our client shared some pictures of what she wants the space to look like to get us inspired for the logo and we CANNOT wait to see to see the finished product. We also got to design their website! You can check it out here. The perfect solution to a night or day out with friends, MyRide provides safe, affordable, and most importantly, fun transportation in the Capital Region. The MyRide team just opened for business in early 2018 and we can’t wait to see this logo on the move! Book you're ride here. Malcolm’s was one of our very first clients when we started Sidekick and we were thrilled when they opened their doors this month (and super jazzed about that sign!). You have to try this new farm-to-table in Schenectady inspired by, and named after, the owner’s grandfather and his passion for food. For the logo we illustrated a bottle from Malcolm’s iconic bottle collection and paired the sketchy illustration with a clean and modern type to unite the history of the story and the family, with the freshness of this restaurant's approach. Seriously, this food is to die for. Make a reservation today! 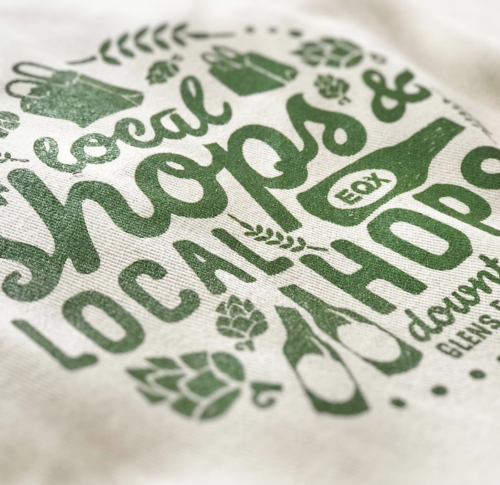 EQX approached us before Thanksgiving last year with an idea for a Small Business Saturday event in downtown Glens Falls called Local Shops & Local Hops. Beer and shopping? Sounds like our style! EQX was in need for a mark for the event that could be used on tote bags, flyers, email blasts, and social media to promote the event. We brewed up a design with hops, shopping bags, wheat, and beer bottles that we knew could be reworked into a fun pattern. We love beer and we love Bolton Landing so we jumped (hopped?) at the opportunity to work with this new brewery that opened in 2017. They already had a logo when we began working with them but they were in need of a secondary logo to use on merchandise as well as tap handle labels for all their beers, event logos and crowler labels. For the secondary logo, we created a graphic representation of Lake George from Bolton Landing and paired it with the heron and typeface used in the original logo. Stay tuned for more projects! And if we start to lag on the blog posts again, make sure you're following us on Instagram for daily updates and sneak peeks on new work! Ramble Design & Goods is Here!